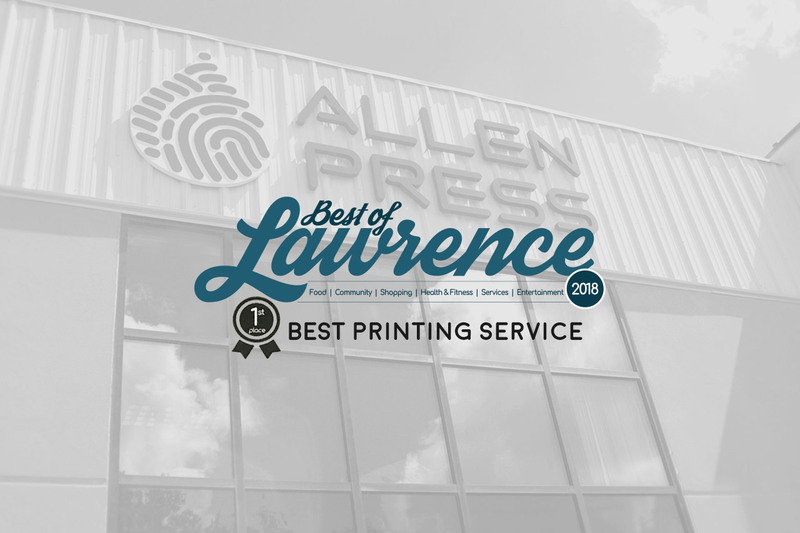 Lawrence, Kan. – June 25, 2018 – Allen Press, Inc. was awarded first place in the Printing Services category and third place in the Advertising/Marketing Services category of the annual Best of Lawrence competition. The company was also listed in the top ten places to work in Lawrence. The Best of Lawrence Awards is an annual competition produced by the Lawrence Journal-World and Sunflower Publishing to honor businesses, individuals, organizations, and ideas that are making an impact in the Lawrence community. Winners are selected by the public through an online voting process. Allen Press has greatly expanded its local presence, enhancing its cutting-edge printing and direct mail capabilities, launching an in-house marketing agency, and hiring Kathy Lafferty as Local Sales Executive. Members of the Allen Press team accepted the awards at the Best of Lawrence Winner’s Bash on June 21 at Abe and Jake’s Landing in Lawrence, KS.